Grab your fountain pens, inks and paper! It's the first friday of november, so we're celebrating the International FOUNTAIN PEN DAY! I'm a klutz and completely forgot to prepare anything for today (SORRY, I'll make up for it). But here are some things you can do instead, apart from the imperative extra attention you should give your beloved fountain pens today of course! - BUY A NEW PEN (always a great idea! ): You can score the usual 10% discount from my sponsors, but only today you can get some extra awesome discounts! Go give them some love and get yourself something nice! Use the code 'pencilcaseblog' for 10% off! Use the code 'Penthusiast' for 10% off! - ENTER IN A GIVEAWAY: Because winning a free pen is even better than buying one! Take a look at these awesome giveaways and enter of course! fingers crossed! GOURMETPENS AND SBREBROWN - will be giving away a Montblanc 144 Ultra Black fountain pen...That's a serious prize! PENADDICT - is giving away a Pilot Custom Heritage 912, and two other pens! WELL-APPOINTED DESK - is giving away a bunch of pens and paraphernalia on her blog! - SHARE THE AWESOME ON SOCIAL MEDIA! : Get writing/ sketching/ doodling and share away on Twitter, Instagram or Facebook. 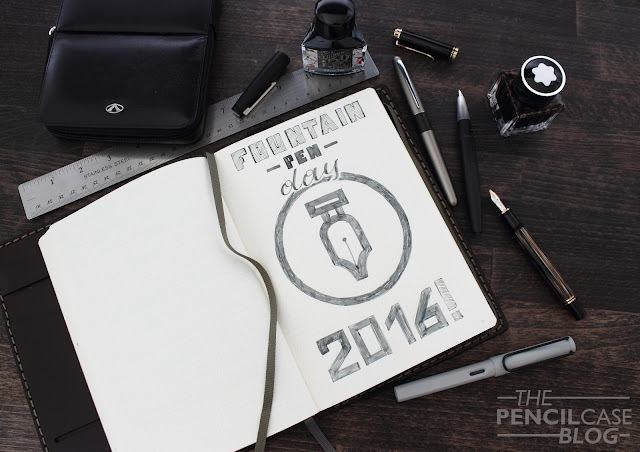 Use the hashtags #fountainpenday or #fountainpenday2016. - NEED MORE TO DO TIPS FOR FOUNTAIN PEN DAY? Go to the fountain pen day website and learn more on how you can celebrate today! Enjoy!